Objective: Opponents of single incision laparoscopic cholecystectomy argue that the single incision at the umbilicus is much larger than in standard laparoscopic cholecystectomy. The primary aim of this study was to investigate the incidence and extent of enlargement of initial skin and fascia incision in standard laparoscopic cholecystectomy. The secondary aim was to detect predictors for such enlargement.Methods: From August 2009 to September 2010, 239 patients with standard laparoscopic cholecystectomy via Hasson’s approach had prospective assessment of the following data: body mass index (BMI), initial and final size of umbilical skin incision, need for enlargement of umbilical fascia incision, number and weight of gallstones, weight and histological examination of gall bladder. Results: The median size of the initial umbilical incision was 27mm (lower/upper quartiles 24/31mm). For gallbladder harbouring, enlargement of incision was necessary in 33.9% for the skin and in 41.0% for the fascia. In patients with acute cholecystitis the incidence for skin (39.8%) and fascia enlargement (50.9%) was significantly higher than in patients with symptomatic gallstone disease / chronic cholecystitis (29.0% and 32.8%, respectively). The median additional size of the skin incision was 7mm (4-15mm). The final incision size was significantly larger in acute cholecystitis than in symptomatic gallstone disease / chronic cholecystitis (32 vs. 30mm, p=0.001). The analysis of variance detected initial size of incision (p=0.004), weight of gallstones (p<0.0001) and weight of the gallbladder (p=0.012) as significant predictive factors for enlargement of incision, but not BMI (p=0.429) or number of gallstones (p=0.318). The receiver operating characteristic showed a probability of 79% to have a final skin incision size >29mm, if the stone weight exceeded 5g. The probability increased to 91%, if the stone weight exceeded 10g. Conclusions: In standard laparoscopic cholecystectomy the umbilical incision frequently requires secondary enlargement, especially for acute cholecystitis and for gallstones weighing >5g. 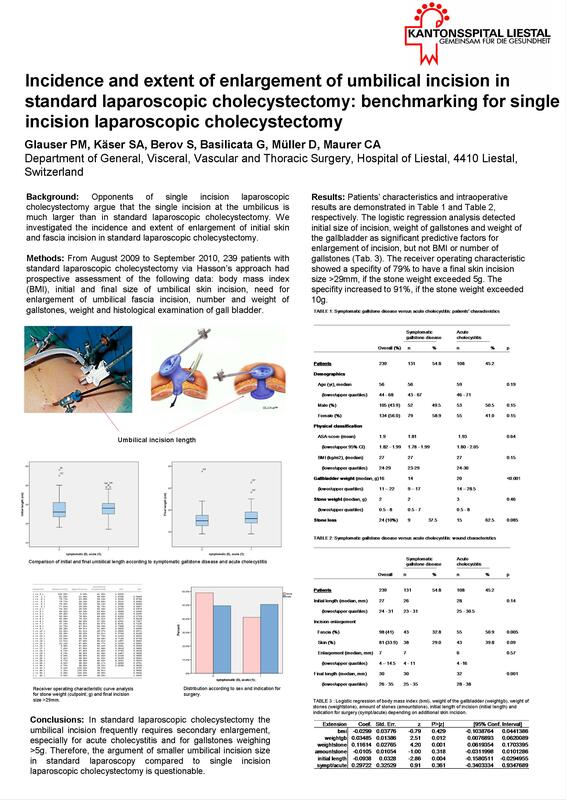 Therefore, the argument of smaller umbilical incision size in standard laparoscopy compared to single incision laparoscopic cholecystectomy is questionable.